The two cousins told CBS they've been in love their whole lives but aren't legally allowed to get married in the state of Utah. 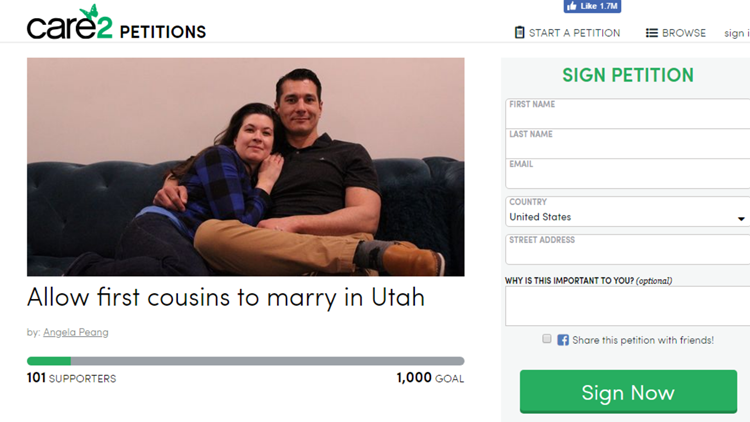 UTAH, USA — Two first cousins, who say they've been in love their whole lives, are petitioning to get legally married in the state of Utah. "We believe that the law is outdated and it needs to be changed so that we can socially legitimize our love," Angela Peang wrote in the Care2 Petition. The couple's goal is to get 1,000 supporters. As of Wednesday afternoon, the petition has 101 signatures. Peang told CBS she's been in love with her cousin, Michael Lee, since second grade. CBS said her father is the oldest of 12 children. His sister, Peang's aunt, is Lee's mother. "We just always played a lot," Peang told CBS. "We went into a closet and we were kissing and dancing together. It just felt really natural." CBS said Peang and Lee got married to other people, but both eventually divorced. Peang also had three children with her now ex-husband. CBS said Peang and Lee hadn't seen each other in about 10 years when they reconnected at their grandmother's house last Christmas. While cousins are not legally allowed to marry in Utah, the law is different in Colorado. CBS said Peang and Lee went to Grand Junction, Colo., on Monday to get married at the courthouse. Most states don't allow marriage between first cousins, but six states allow it under certain conditions. CBS said Utah is a state that allows marriage between first cousins if both are over the age of 65. Peang told CBS News the family, conservative Mormons, had mixed reactions to their union. Their parents reportedly feel their love might "threaten the family's identity." Her youngest child was OK with the situation, but her two older daughters initially thought it was "weird" and "wrong," according to CBS News. Now, all the daughters have reportedly grown to accept the situation.